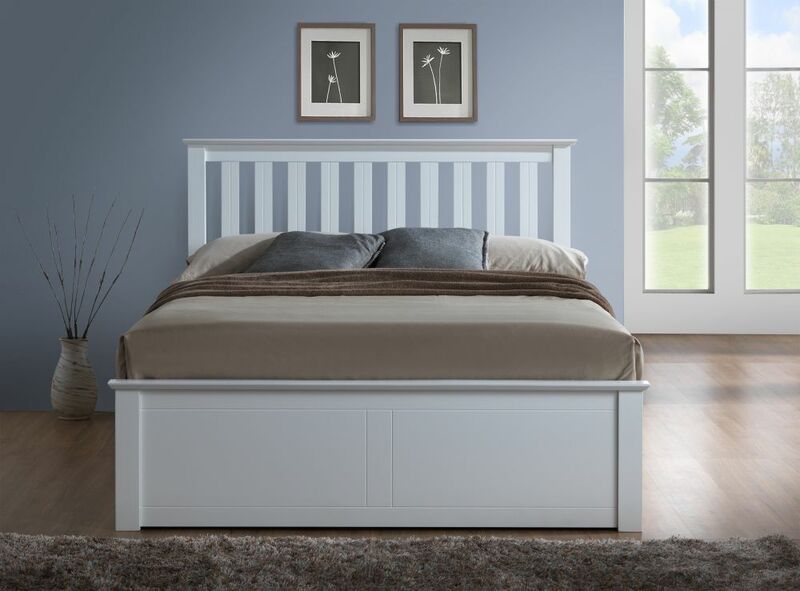 Simply stylish with an undeniable element of beauty, the Phoenix White Wooden Ottoman Storage Bed offers a respectable amount of storage space for bedrooms that need to make the most of the space available. The modest sized ottoman section is accessed via gas powered pistons, which lifts to the comfortable and secure sleeping area up to reveal segregated sections, each of which perfectly host an array of different bedroom possessions. Crafted from the highest quality solid oak available, the Phoenix White Wooden Ottoman Storage Bed is then finished in a classic white. An excellent and soothing addition to the bedroom, the Phoenix White Wooden Ottoman Storage Bed is sure to act as a delightful centrepiece to any master bedroom, regardless of the current decor. This minimalist and contemporary sense of aesthetics is all the more enriched by the solid slatted headboard, which makes the Phoenix White Wooden Ottoman Storage Bed all the more adaptable to bedrooms, whether it's placed in a guest bedroom or the master bedroom. Both the footend and the top of the headboard, as well as the interior, is clad in the same, calming oak finish adding to the delightfully natural feel. 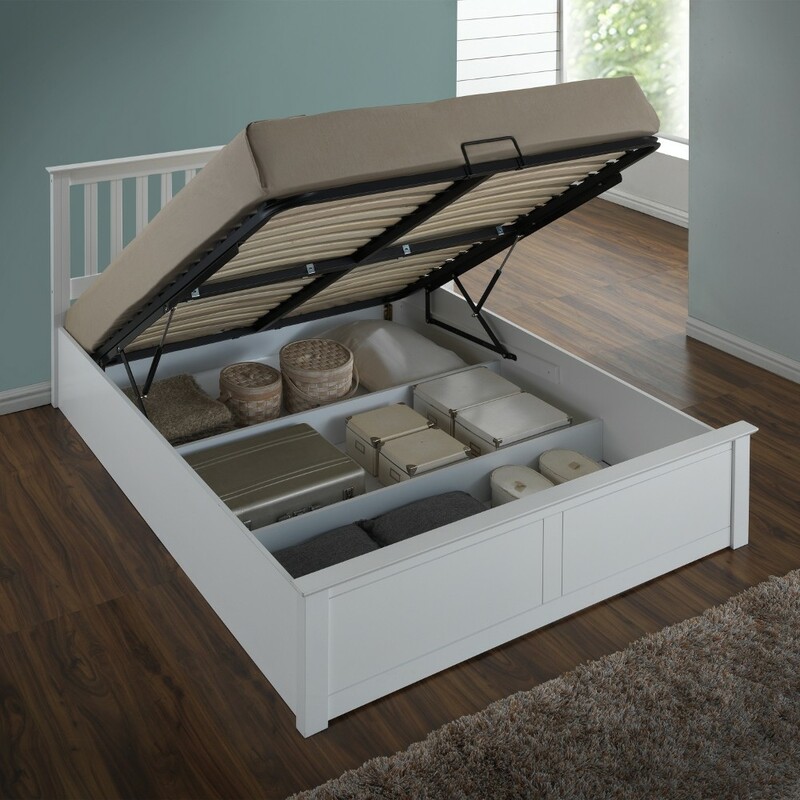 Offering ample storage space, the Phoenix White Wooden Ottoman Storage Bed is separated into three equal parts, neatly accommodating anything from items of clothing to spare bedding. 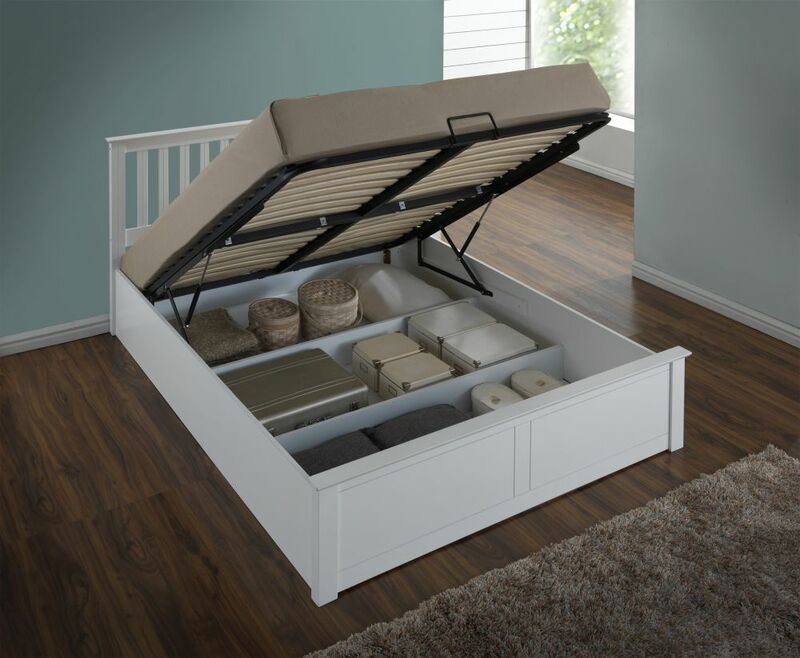 The Phoenix White Wooden Ottoman Storage Bed can safely store away a wealth of belongings, thanks to the impressive depth of 27cm of storage space from base to sleeping base. This sleeping base is a sprung slatted base, which provides sleepers with a secure sleeping surface that's extremely comfortable. Featuring an assembly process as simple as the design is sublime, the Phoenix White Wooden Ottoman Storage Bed is incredibly durable. Arriving as a flat packed piece of furniture, the Phoenix White Wooden Ottoman Storage Bed comes partnered with simple to follow assembly instructions that makes the construction process relatively easy. 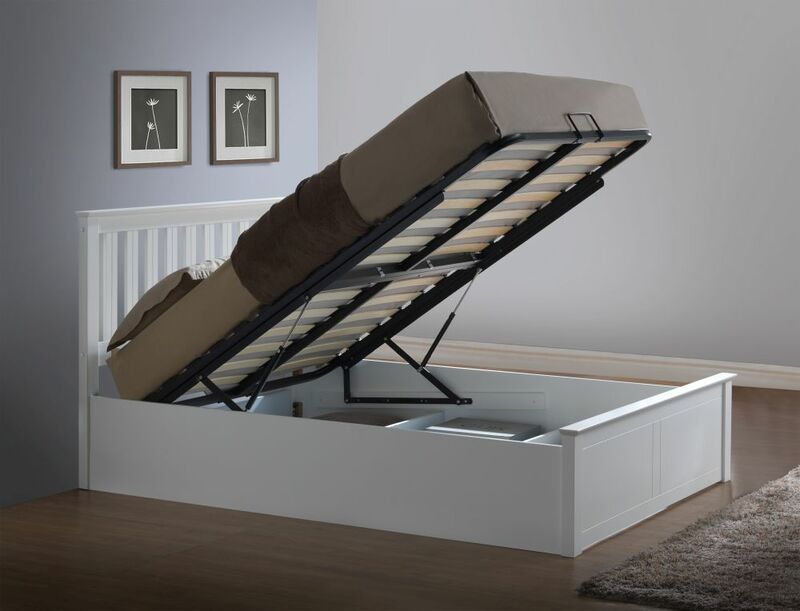 Hi, what’s the difference between this and the macolm white ottoman bed you have on the website? I am assuming you mean the "Malmo" Ottoman bed. The difference is that the Malmo is constructed entirely of solid wood whereas the Phoenix has mdf siderails (the side panels of the bed). The dimensions are correct. A Double is 15cm wider than a small double but they are both the same length, 190cm. The specific dimensions for the 5ft (King Size) Phoenix Ottoman are written underneath the header 5ft Bed Frame. The common dimensions are dimensions that are the same for every size of bed frame. What sort of mattress can this unit handle? I have a pretty heavy memory foam mattress, would that work? I guess I could just tweak the pistons to handlle the increased weight? The maximum mattress weight that the Phoenix White Ottoman can handle is 60kg. It is not advised to make any adjustments to the mechanism as this will void warranty. The Phoenix Ottoman's width measurements are taken from the top of the headboard as this is the longest length. What lead time is there on orders, or do you have these in stock to send immediately? 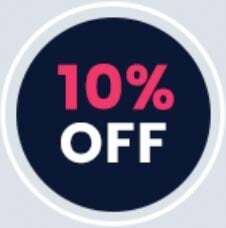 If you input your post code in the delivery options box on the right of the listings page you will be able to see what dates you can have your Phoenix Ottoman in White delivered. It is currently in stock. The Phoenix White Wooden Ottoman has the dividers in position to bolster the weight of the bed. Without them, it would case the side panels to bow so they are not optional. The Phoenix Ottoman can not be built without a headboard. can I pay the company to put the bed together and take my old one away ? Whilst we do not offer a flatpack construction service, the Phoenix Ottoman comes with concise instructions. As for removal of your old bed, we do offer this service. For more information, if necessary, email [email protected] or call 03334440180. You are right that 5ft is 152cm. The way that beds are usually sized is 3ft/single, 4ft6/double, 5ft/king etc. This doesn't refer to the size of the bed but to the size of the mattress. 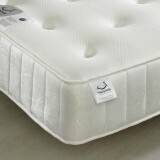 The firmest mattress we sell is the Supreme Ortho.